Fancy a low-key trust that has trashed the market for over three decades with the same fund manager at the helm? Well, Rights & Issues fits that bill. During my whistle-stop tour of small-cap investment trusts that specialise in UK stocks, I mentioned that I liked the look of this fund. Having looked at it in more detail since I like it even more. Simon Knott has been managing Rights & Issues for 35 years. What’s more, he and his family own 15% of its shares. That gives him major ‘skin in the game’ as our American cousins like to say. From 1990, Knott also managed MI Discretionary Unit fund, which invests in similar companies to Rights & Issues but is about a quarter its size. He seems to have passed the reins to Melvin Mehta recently and the two portfolios have started to diverge somewhat. I’m not sure where the name Rights & Issues comes from. But it’s one of those old-fashioned monikers that investment trusts seem to excel at. Think British Empire Trust, Scottish Mortgage or, until recently at least, Foreign & Colonial. The Board’s objective is to exceed the benchmark index [the FTSE All-Share] over the long term whilst managing risk. The Company invests in equities with an emphasis on smaller companies. UK smaller companies will normally constitute at least 80% of the investment portfolio. 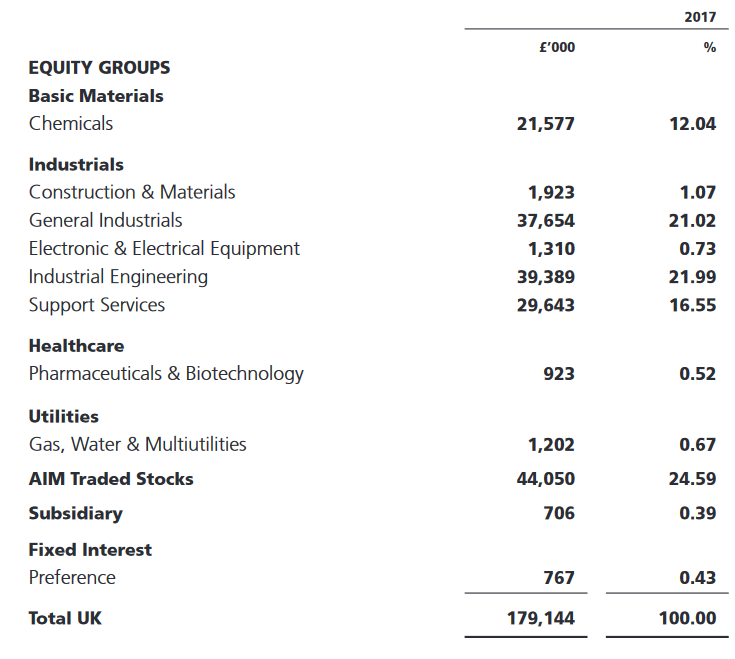 UK smaller companies include both listed securities and those quoted on the Alternative Investment Market (“AIM”). The investment portfolio will normally lie in the range of 80% to 100% of shareholders’ funds and therefore gearing will normally be between –20% and 0%. The Knott family have been involved for a long time. Simon H J A Knott, who I assume is the father of Simon J B Knott (the current fund manager), was involved since at least the late 1970s and was chairman for 27 years until he retired in 2010. Incidentally, if you’re ever looking for old copies of reports and accounts to research an investment trust for obscure blog articles, then make sure you check the Companies House website. The filing history page for Rights & Issues contains accounts since the early 1990s, one from 1978 and even its incorporation document from 1962. Sometimes, older documents aren’t available for free online but can be accessed for £3 with a phone call. One point of note is that Rights & Issues used to be a split capital trust, with separate share classes for capital (the ticker was RIIC) and for income (the sole remaining class now, with the ticker RIII). Many split capital trusts were involved in a major scandal in the early 2000s, with investors losing £700m. Rights & Issues was not involved, as far as I am aware, but the ongoing mistrust in split capitals meant that it traded on a wide discount to net assets of around 20% for several years. The board of directors eventually bit the bullet and converted the share capital of the company into a single class in June 2016. Since then, the discount to net assets has narrowed considerably to its current level of 6%. However, there has also been a major share buyback programme over the last couple of years, with about £20m spent to date. The buyback programme only kicks in if the discount exceeds 8%. Few shares have been bought in recent months, as the discount has been a little smaller than that. I suspect the 8% level might be revised when Rights & Issues releases its 2018 results in a few weeks’ time. Articles about Knott are few and far between, but they usually mention his love of chess. He was British under-18 champion and is an International Master. 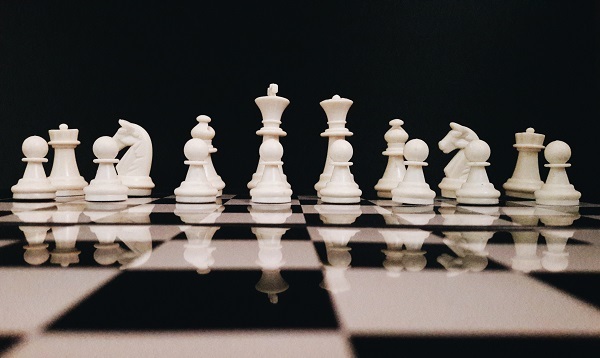 Chess gives you mental discipline – clear, analytical thinking. The important thing in chess, as well as the stock market, is to make good decisions and to keep your error rate down. Stock-market investing involves complex decision-making, but the point is you need to take the best possible view on a particular situation, come up with some idea of what the probabilities are around that situation and be more accurate than other people doing it. It’s difficult to justify marketing spend for a small organisation like mine. I generally get a better return on my time and effort by running this fund better. With salesmen working on historic relationships, it often means performance doesn’t matter… because I don’t push myself forward, I have a lower profile. I live or die on reputation. That’s exactly the kind of thing you want to hear as an investor. And he’s been consistent with this strategy, as this 2017 Citywire video demonstrates. As Knott is essentially a one-man band, the costs for this fund are extremely low, at less than half a percentage point a year. In fact, it’s very reminiscent of another fund I looked at recently: Independent Investment Trust run by Max Ward. Its costs are even lower, but then Independent is about 50% larger. At 60, Knott is nearly 10 years younger than Ward, but what happens when he retires is obviously a key question for potential investors. I haven’t come across any statements made by the company regarding this but it does have five-yearly reviews regarding the trust’s future. The last one was in November 2015 and recommended continuing operations until at least July 2021. 2018 was a tough year for many small-cap funds, and Rights & Issues certainly didn’t escape the carnage. Its net asset value fell 11% to 2,118p although it has since recovered to 2,245p, clawing back half of 2018’s drop already. 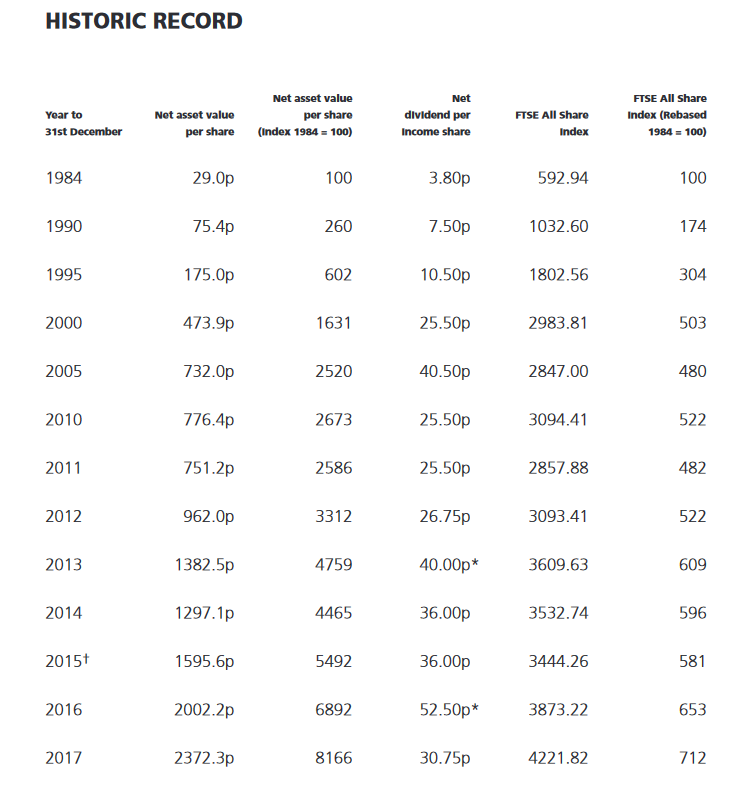 We can see that Rights & Issues has produced an average annual gain of 14.3% since 1984 whereas the FTSE All-Share managed just 6.1%. However, I think these figures may exclude dividends. Rights & Issues currently yields 1.5% compared to the FTSE All-Share’s 4.3%. If dividends were reinvested, the gap would narrow considerably, although I suspect Rights & Issues would still be comfortably ahead. Over the last 10 years, Rights & Issues is up 598% in net asset value terms on a total return basis. The All-Share is up 160%. An easy win for Knott. Small-caps got hit hard by the financial crisis, making February 2009 a generous starting point. But when you consider that ‘value’, the investing style used by Knott, has been out of favour for much of the last decade, his recent outperformance is highly impressive. Knott runs a tight ship, typically only investing in a couple of dozen companies. A handful of positions account for the vast majority of the portfolio. The top 7 positions account for 72% of net assets. 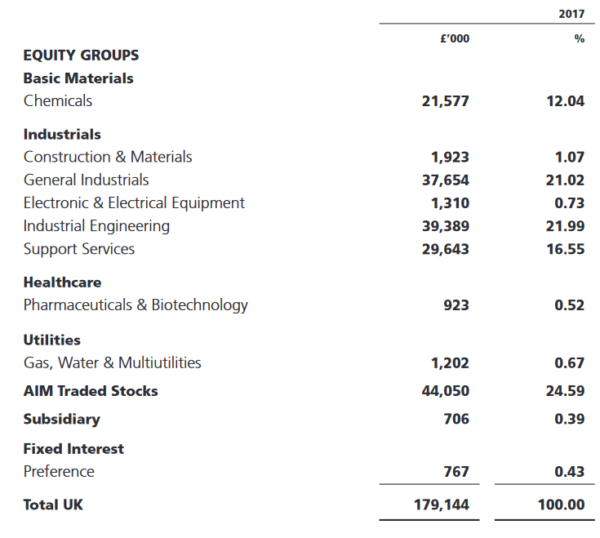 It’s pretty much all small-caps at the moment, with holdings in National Grid and GlaxoSmithKline being the only larger companies in the mix. Rights & Issues also owns a stake in its management company, Discretionary Unit Fund Managers. However, unlike Lindsell Train where the management company stake accounts for nearly half of net assets, here it’s just 0.4%. You can see it’s pretty much all chemicals, industrials, engineering and support services — so largely traditional industries and no trendy glamour stocks. The quarter of the fund invested in AIM shares isn’t broken down by industry. It largely comes from four holdings: Scapa (chemicals), Colefax (household goods), Elecosoft (software), and Titon Holdings (construction). Of the top 20 positions held at the end of 2016, only 8 saw any shares either bought or sold during the following year. By value at the end of 2016, 5% of the portfolio was purchased during 2017 and 12% was sold. And you can see from this in-depth review by Monevator in 2009 that 7 of the current top 10 holdings were all major positions a decade ago. Monevator’s purchases in late 2008 and early 2009 should have done him proud, so I hope he’s still holding! Rights & Issues has large position sizes in many companies. That can make it hard for the trust to trade in and out without affecting the underlying share price. In other words, while Colefax represented around 7% of Rights & Issues’ portfolio at the end of 2017, Rights & Issues owned 24% of Colefax’s shares. In practice, Knott mostly sells when a company receives a takeover offer. Therefore, illiquidity may not be a major concern. RPC, his second largest position at 11.5%, is currently being bid for. That might increase the trust’s cash position considerably to around 20%, should a deal be completed. Rights & Issues own shares can be pretty illiquid as well, so any sizable position might need to be broken into several purchases on the way in and several sells on the way out. Although the indicated bid-offer spread is less than 3%, only about £100,000 of the trust’s shares are traded in a typical month. Mind you, the Monevator article says the spread was 180p-250p in March 2009, making the current 3% spread look negligible! The normal market size is just 75 shares. So, at £21, this means the quoted bid and offer prices might not apply for deals of around £1,600 or more. There’s much to admire with Rights & Issues: low costs, low portfolio turnover, a manager that owns a chunky stake in his own fund, and that great track record. The main negatives are the trust may not continue if Knott retires and that taking a large position might be tricky. Those who like reams and reams of information about the underlying investments are likely to be disappointed. 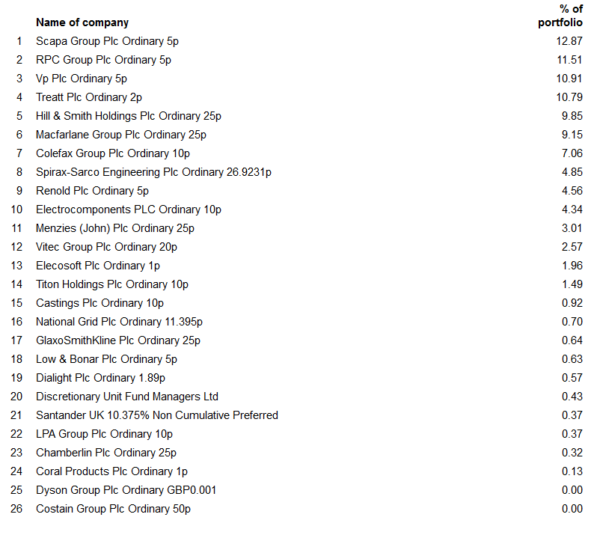 As the holdings don’t change that much, there’s often little for Knott to say. There are no monthly factsheets commenting on market trends. Most of the commentary in the report and accounts changes little from year to year. Nevertheless, while value investors have struggled as a group, Knott seems to have flourished. I’ve already got three UK small-cap investment trusts in my portfolio, albeit each with small position sizes, but I’m sorely tempted to make it four. Note that I may own some of the investment trusts mentioned in this article. You can see my current holdings on my portfolio page. Nothing in this article should be regarded as a buy or sell recommendation as this site is not authorised to give financial advice and I'm just a person writing a blog. Always do your own research! Get notified of new posts I publish by entering your details below. Your email address won't be used for anything else. Previous Post: KIDs: The Gloves Are Off! Next Post: Who Runs Your Investment Trust? Disclaimer: This site is for informational purposes only. I make no assertions as to the accuracy, completeness, suitability or validity of anything on this site.